An explosion during an auto parts plant fire in Eaton Rapids, MI, was “just how a bomb works” and was so violent it threw a worker through the air into a door jamb. 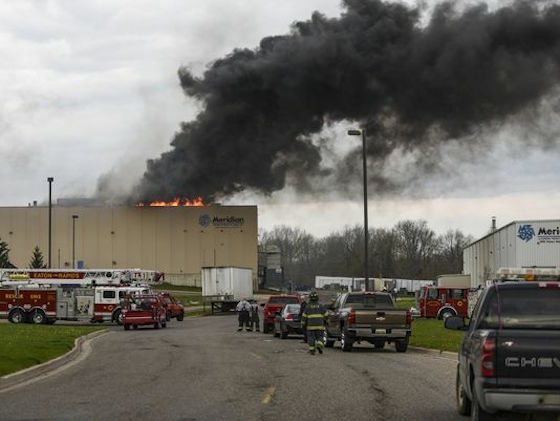 The explosion and a subsequent blast early on the morning of May 2 at the Meridian Magnesium factory in Eaton Rapids occurred because the fire suppression system at the plant added water to molten magnesium. Experts said that is like arming a bomb. That fire and blast ultimately stopped production of the Ford F-150. Firefighters called to the factory went to the maintenance room “and looked at the bottom of the scrap conveyor (where) we saw a white glow in the tunnel. We exited the plant at that time,” Eaton Rapids Fire Chief Roger McNutt wrote in his official report. That was at 2:01 a.m. Rob Mickey was one of many laborers, ironworkers, riggers and operators called into work by Walbridge construction immediately following the fires.